If you’re looking for a fitness regimen that will help you keep fit throughout your pregnancy, consider doing some water aerobics. Being in water will take the weight off your legs and back and you will feel more comfortable working out. Aside from that, aquarobics has been shown to help during labor. 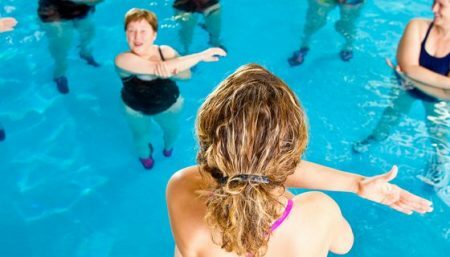 According to a study published recently in the journal Reproductive Health, a course of water aerobics classes done by sedentary and low risk pregnant women has been shown to reduce the amount of pain-killing medication women request during labor. If you are not currently exercising and would like a program you can be comfortable with, an excellent, low-impact program for pregnant women is aqua aerobics or water fitness. 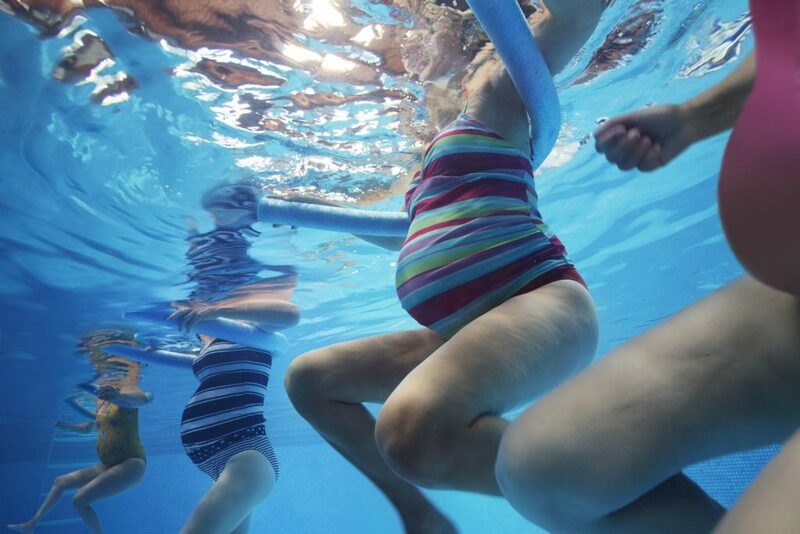 Aqua aerobics has most of the fat-burning and endurance-building qualities of land-based aerobics, without the high-impact pounding that can be dangerous while pregnant. First of all, remember that you sweat, even when you’re in the water, so you need to drink plenty of water before, during and after your workouts. Always keep a water bottle nearby so you can take a good swig every 10 minutes or so. Secondly, be sure to wear a bathing suit with a supportive top (or wear a jog bra underneath your swimsuit). You might also want to wear an abdominal support as your pregnancy progresses — as your belly and breasts get larger, they’ll also be more pendulous, and movement through the water can get uncomfortable. Thirdly, slow your movements as necessary so that you aren’t exercising to exhaustion. The water offers a lot of resistance, and trying to move your growing body through it can be very tiring! 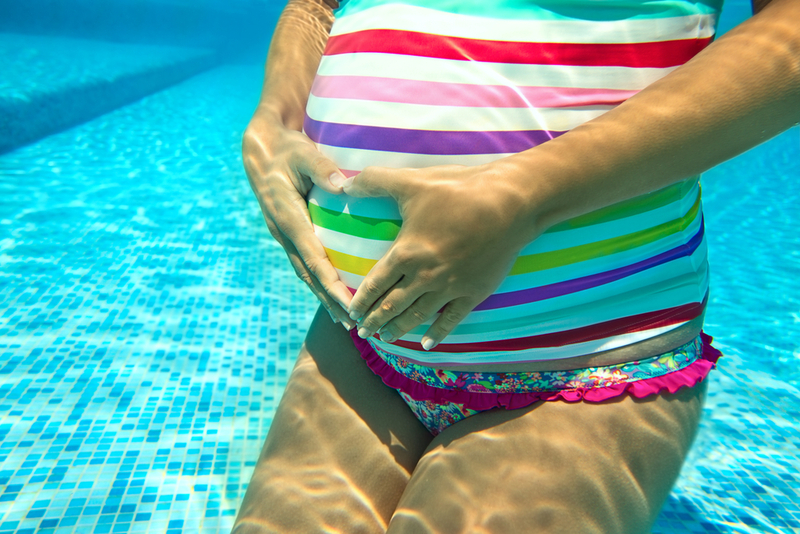 If you’re in an outdoor pool, be sure to wear sunscreen and a cap or visor because your skin can become more sun-sensitive during pregnancy. For the most benefit, exercise regularly. A good rule of thumb is at least 20 minutes three times a week. Begin slowly and increase gradually. This is not only more comfortable, but also safer. Water exercise is easy and safe, as well as beneficial to all levels from beginner to advanced. You don’t need to be able to swim to participate in water workouts – many moves are performed in waist or chest-high water, and you don’t even need to join a special organized class; simply swimming laps, or walking, jogging, or running in water will strengthen your core, trunk muscles, legs and hips, and increase your cardio-respiratory fitness. While water workouts don’t require any special equipment, there are flippers, foam tubes, webbed gloves, and water weights available that can enhance the moves. The best way to exercise is to be in water at arm pit level when standing. Recommendations for a good water class include: 1) warm up, 2) exercise and 3) relaxation. For a great 30-minute workout, alternate aerobic activity with strengthening moves. Warm up for five minutes or so by swimming a few laps or walking back and forth across the pool. Then alternate high-intensity walking or jogging with low-intensity recovery periods. The length of each interval will depend on your fitness level – start with 15 seconds and see how you feel. Repeat this high-low interval for 3 minutes, then perform one of the following strengthening moves. Follow this with another aerobic set and then another strengthening move, continuing this way for 30 minutes. Cool down for five minutes by swimming some laps or walking around the pool, and be sure to do some gentle stretching. Stand in the shallow end of the pool facing the stairs. Step up onto the lowest step, and then back down. Repeat 10 times, slowly, leading with your right leg; then 10 times leading with your left leg. Turn sideways so the steps are on your right and step up, leading with your right leg, 10 times. Turn so the steps are on your left and repeat with your left leg. Finally, turn so the steps are behind you and step up backwards 10 times, leading with the right leg and 10 times leading with your left leg. Hold on to the bar or side of the pool for balance if necessary, but don’t pull yourself up with your arms. Hold a kick board in front of you with both hands so it’s up on one end and immersed halfway in the water. Walk from one side of the pool to the other while pushing the kickboard in front of you and concentrate on keeping the board straight. Turn around and walk back to the starting position, zig-zagging the board in front of you. Stand with your back to the side of the pool, holding onto the rim with your elbows. Keeping your knees straight, slowly bring both legs up to a 90-degree angle in front of you and hold it for ten seconds while exhaling slowly. Then bend at the knee to bring your legs down, and repeat as many times as your fitness level allows. Be careful to keep your back straight throughout this exercise. Lifting the Baby (targets the arms). Stand with your elbows bent, palms facing up, floating on top of the water, (to make this even more challenging, wear webbed gloves or use water paddles). Bend your knees and lower your body into a squat position. At the same time, pushing your hands (or the paddles) down through the water until they’re in front of your thighs. Rise up to the start position, curling your arms up toward your shoulders. Repeat 12-15 times. Charlie Chaplin Walk (targets the middle and upper back). Tuck your elbows into your sides, hold your hands out to the sides with your thumbs pointing up. Walk the width of the pool twice forward and twice backward. The dolphin kick is one of the best exercises to do in the water, as the water allows you to do movements and work muscles that you aren’t able to on land because of the buoyancy. Note: Don’t expect to keep your pre-pregnancy pace, and stop immediately if you experience fatigue or dizziness, headache or cramping. Call your doctor if you notice any vaginal bleeding, contractions, unusual absence of fetal movements (although your baby is naturally quieter when you are most active), blurred vision, or difficulty walking.